JEFF KERKOVIUS CONSIDERS HIMSELF LUCKY to have grown up just 30 minutes from a university he regards as superior to any other he might have attended. It’s likely his professor would say it’s the Department of Chemistry that was fortunate. Why Chemistry? Now entering his final year of undergraduate studies, Kerkovius hails student opportunities to conduct research. proteins that may play a part in neurodegenerative diseases like Alzheimer’s. He was Chair of the 2015 Western Canadian Undergraduate Chemistry Conference, a research assistant in an organic chemistry lab, and formerly worked in a hydrology lab. He is also a Supplemental Learning (SL) leader, a paid position he credits with igniting his passion for teaching. Kerkovius has spent countless hours in Menard’s lab. He’s also immersed himself in campus life, joining the UBC Okanagan Heat’s Cross Country team for one year, and serving as Tutor Coordinator with the Chemistry Student Union. 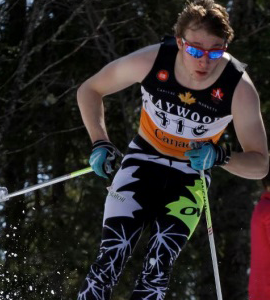 He also took a one-year sabbatical from his studies, during which time he skied competitively and trained at the Callaghan Valley National Training Centre, a Whistler-based facility where select World Cup hopefuls are groomed. 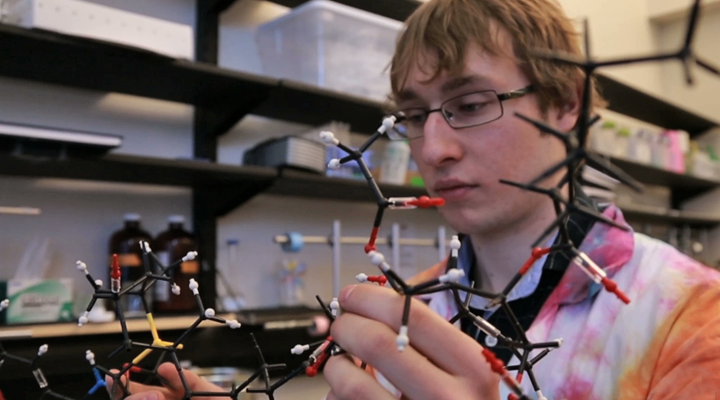 Six months into the program he realized he missed chemistry desperately. He finished the year skiing, but only after buying the supplies needed to complete experiments in a makeshift workshop he built at the training centre. Kerkovius says there is no doubt he was born a scientist driven to satisfy his curiosity by solving problems. In UBC, he found a university well equipped to nourish his curiosity and challenge him in ways he hadn’t thought possible. In Spring 2016, Kerkovius graduates from UBC Okanagan and plans to move on to graduate studies at McGill University, where he will work under Professor Jean-Philip Lumb. He says it’s time to move out of his parents’ West Kelowna home and spread his wings. UBC Okanagan’s loss will surely be McGill’s gain.